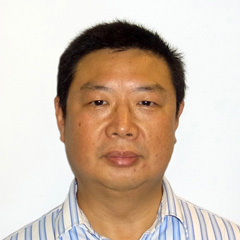 Dr. Xu Liu joint CIPR/KFUPM on September, 2017 as Research Scientist III. Ph.D. degree in Geophysics from the University of Adelaide, Australia. M.S. degree in Geophysics from the University of Science and Technology of China. B.S. degree in Geophysics from the Chengdu University of Technology, China. Liu Xu, Greenhalgh S., Zhou B. and Greenhalgh M., Effective Biot Theory and Generalization to Poro-viscoelastic Model. Geophysical Journal International, in pressing. Liu Xu, Greenhalgh S., Zhou B. and Heinson G., Generalized poroviscoelastic model based on effective Biot theory and its application to borehole guided wave analysis. Geophysical Journal International, Vol.207(3), 1472-1483. Liu Xu and Greenhalgh 2014. Reflection and transmission coefficients for an incident plane shear wave at an interface separating two dissimilar poro-elastic solids. Pure and Applied Geophysics, Vol.171(9), 2111-2127. Greenhalgh Liu Xu, and Zhou B. 2014. A model for determination of effective permeability from acoustic wavespeed and attenuation in a rigid two-phase porous medium. Near Surface Geophysics, Vol.12(3), 391-404. Greenhalgh Liu Xu, and Zhou B. 2012. Velocity and attenuation dispersion relations for the effective Biot model: total-field formulation. Near Surface Geophysics, Vol.10, 197- 206. Liu Xu, Greenhalgh and Wang Y.H., 2011. 2.5D poro-viscoseismic wave modeling in double porosity media. Geophysical Journal International, Vol.186, 1285-294. Liu Xu, Greenhalgh and Zhou B., 2010. Approximating the wave moduli of double porosity media at low frequencies by a single Zener or Kelvin-Voigt element. Geophysical Journal International, Vol.181, 391-398. Liu Xu, Greenhalgh and Zhou B., 2009. Transient solution for poroviscoacoustic wave propagation in a double porosity medium, and its limitations. Geophysical Journal International, Vol.178, 375-393.